Virgin Galactic’s second SpaceShipTwo spaceliner is lowered onto its landing gear for the first time. On Nov. 9, 2015, Virgin Galactic announced the selection of NASA test pilot Kelly Latimer as the latest spaceship pilot to join its ranks. Kelly Latimer, the first female research test pilot ever to join what is now NASA's Armstrong Flight Research Center, has joined Virgin Galactic as the spaceflight company's newest pilot. Kelly Latimer, experienced research test pilot and newest Virgin Galactic flier. Latimer, a retired a lieutenant colonel in the U.S. Air Force, worked on NASA projects such as the 747 space shuttle carrier aircraft, the T-34 and the Stratospheric Observatory for Infrared Astronomy (SOFIA), a flying astronomical observatory. Latimer has more than 6,000 flight hours and 1,000 test flight hours in over 30 aircraft during her work with NASA, the Air Force and Boeing. 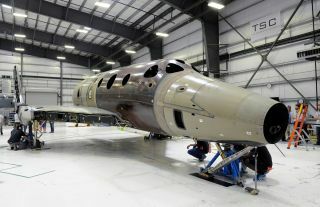 "Kelly's impressive leadership in operations and experience with heavy aircraft and as a test pilot make her well-suited for our upcoming return to flight," Mike Moses, Virgin Galactic's senior vice president of operations, said in the same statement. "We look forward to Kelly's contributions in what is sure to be a busy and exciting year ahead." Latimer is a retired U.S. Air Force pilot, having worked as an instructor at Edwards Air Force Base and as senior advisor to the Iraqi air force. She flew more than 90 combat sorties in support of Operation Enduring Freedom and Operation Iraqi Freedom, and she was also the 418th Flight Test Squadron commander. At Boeing, Latimer was involved with system development as well as aircraft design, engineering and certificate. She did the first flight tests for the company's KC-46/767 aerial tanker program, and was deputy director for airlift operations (as well as chief pilot) for the C-17.